Bumble and Bumble Seaweed Shampoo is the ideal product for any frequent bather of practically any hair type. This color compatible shampoo is to be used daily by massaging on the scalp and rinsed out thoroughly. This Seaweed Shampoo is a moisturizing cleanser made with unique marine extracts from the great green seas. Sea Silk Extracts: Nourishes the scalp and promotes healthy looking hair. Sea Weed extract: Moisturizes, adds elasticity with softness and body. Spirulina Maxima Extract: Hydrates the hair. 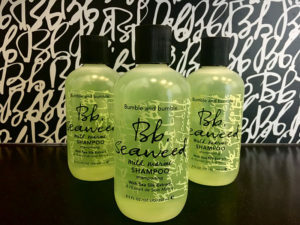 If you plan on hitting the beach this summer and need a go-to shampoo in between your days in the water, this Bumble and Bumble Seaweed Shampoo is the ideal lather for you!